Yesterday, I shared my thoughts about Aras PLM replacement strategy. Check this link for more information. Today, I want to share an opposite view from PTC. I had a chance to attend think tank session organized by Zerowait-state and PTC. We discussed the reality of modern PLM including technology, competition and transformation of PLM companies. Very often, PLM is strongly associated with engineering processes and tools. CAD and PLM are strongly bundled. Leading PLM vendors (Dassault, Siemens PLM, PTC) are providing vertically integrated solutions with fairly standard set of functionality for CAD, PDM and PLM. The topic of IoT PTC transformation is a factor that is changing a traditional status quo. Check the following slide. What I’ve learn is that PTC is position themselves as Industrial Innovation platform. If you following terminology, it is a change from IoT platform. The later place is belonging to large players with horizontal technologies – Microsoft, IBM, etc. PTC is focusing on a data as a central piece of information in industrial company and its lifecycle. You can ask, where is a difference from previous PLM? My hunch, it comes from variety of data sources not limited to engineering and product development. It includes everything – connected product, analysis, factory operations, supply chain. And this is where PLM overlays are coming into place. 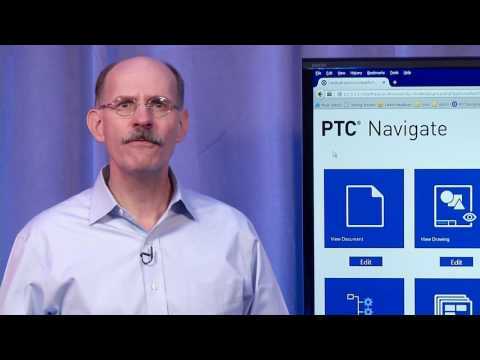 PTC Navigate, the product that was introduced about 2 years ago is positioning is a key technology that will allow to PTC to embark into a journey of collecting information from multiple systems and integrating it into a cohesive information view lenses.